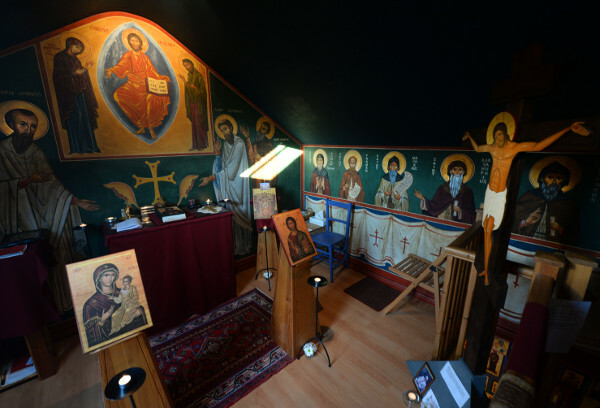 The fully frescoed private chapel in Keswick is in the attic of Fr John’s and Jenny’s home at 16 Greta Villas, Keswick, CA12 5LJ. Services of Matins and Vespers in English, are said almost every weekday. The services are the very beautiful traditional ancient services, based on the Psalms, that have come down to us from the early churches, such as Constantinople (Byzantium, now Istanbul) via Russia, and have been lovingly translated into an English that is both respectful yet accessible. Many parts of the service are sung to traditional Russian tunes, (the eight tones). For our parish use some parts of the services, for instance the Canon at Matins, that are traditional in orthodox monastic tradition are omited. To attend a service, or to visit, please phone (017687 71230) or use the Contact Form ahead of time to make an appointment. Greta Villas is a line of cottages that will be found directly opposite the exit of the Otley Road long term car park. Use the google map to find your way. There is a big stone sign on No. 16, announcing it as the Orthodox Community (which we were before becoming a parish). Parking can be expensive in Keswick, there is limited free on-street (2 hours) disk parking in Station Road (North) just up the hill behind Greta Villas. Probably the best kept secret jewel of the town of Keswick, the fully frescoed chapel in the attic of the Musther’s home is a revelation. The frescoes are by the celebrated orthodox iconographer Aidan Hart.